The term "biomarker" refers to any of your body's molecules that can be measured to assess the state of your performance and personal health potential. Molecules can be obtained from your blood, body fluids, or tissue. An imbalance in biomarkers, specifically performance hormones like Testosterone, Estrogen, Insulin Growth Factor-1, and Cortisol, can play a significant role in optimizing performance and body composition! 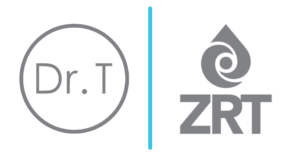 Dr. Tiff has partnered with ZRT Labs to provide clients the most advanced, evidence-based hormone testing and stress testing available. "When I met Dr. Tiff I had no idea how to count macros. I didn't think there was enough time in the day to keep up with it. With her help and suggestions I was able to figure out how to make it work for not only me but for my family as well. When my weight started to drop I realized how my version of "healthy" eating had been out of balance. The coaching program and process has forever changed the way I eat, cook, bake, dine out, and feed my family." Choose a test option for pricing, details and signup. Schedule a Free 15-minute call and let's look at options.